As a living, breathing city, Dubrovnik has a full menu of activities and pleasures all year round. 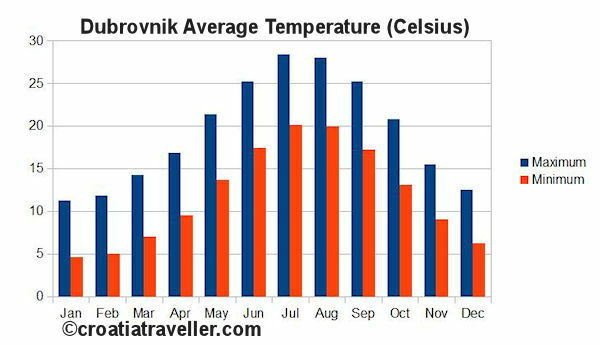 There is no "wrong season" to visit Dubrovnik; each season has its pleasures. A walk on Dubrovnik's famous walls can be memorably moody in winter, glorious in spring and autumn and sun-baked in the summer. The rich architectural heritage of the Old Town is always on display and Dubrovnik's museums are open all year. 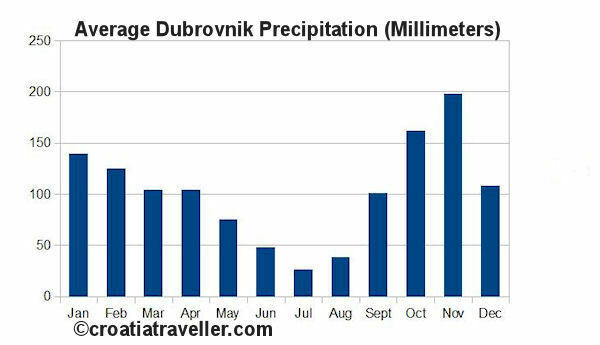 With a Mediterranean climate, Dubrovnik has hot dry summers and rainy winters. Snow is extremely rare. As the charts below indicate, if it's beach weather you're after June to September are the most reliably warm and sunny months. In May and October there are usually enough pleasant days to integrate an afternoon at the beach into your schedule. As for the rest of the year, a beach day would be a rare and special experience. June through September are Dubrovnik's busiest months as cruise ships chug in and out of the harbors with thousands of passengers, international flights keep Dubrovnik's airport busy and the streets of the Old Town are jammed with sightseers. It's an exciting time though, particularly when the Dubrovnik Summer Festival gears up in July. Accommodation can be scarce and prices are the highest. It's essential to reserve ahead. Day trips to the islands are easy to arrange with regular catamarans whisking passengers to Mljet and Korcula (see the schedule) as well little Lokrum and the Elaphiti Islands. It's one of my favorite times to visit Dubrovnik as the weather is still mild but not overly hot. The beach is still a possibility even as late as mid-November. Dubrovnik receives cruise ships through October however and the streets are still buzzing with visitors, although fewer than in the summer. It's a great time to enjoy the burgeoning culture season as the Dubrovnik Symphony Orchestra starts their concert series and art galleries unveil their latest exhibitions. By now the tourists have well and truly left and it's time for the locals reclaim the city. Christmas in Dubrovnik is truly magical as the streets of Stradun are ablaze with lights and local craftspeople display their wares in the Christmas Fair. It's a time to sample the goodies offered by local chefs to the tune of traditional Christmas songs. 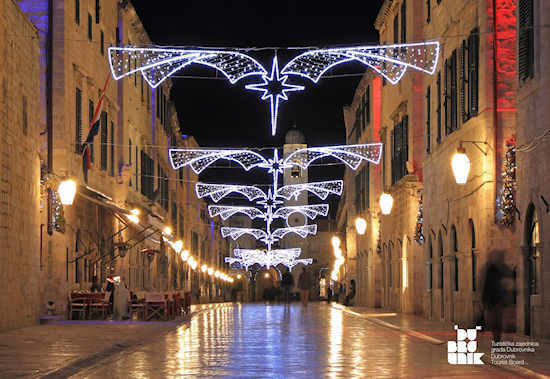 The celebration reaches an apex on New Year's Eve when all Dubrovnik welcomes the New Year on Stradun. Then, all is calm until the Feast of Saint Blaise in February soon followed by Carnival. Accommodation prices are at their lowest level and even Dubrovnik's sights are cheaper in winter. Day trips to the islands are tougher to arrange though as catamaran services to the islands have ended for the season. Easter is a solemn event in Catholic Dubrovnik that begins with a beautiful Good Friday procession. The religious festivities are followed by the Dubrovnik Easter Fair, another celebration of local crafts and traditions. Music lovers will appreciate the new Dubrovnik Musical Spring which features the Dubrovnik Symphony Orchestra in a full cycle of classical music concerts. More info here. Watch for special hotel deals at this time as hoteliers aim for a strong kickoff to the tourist season.